A word so variously used that I can only illustrate it by a few examples. May signify to rob them. If a man's shoe happens to pinch, or gall his foot, from its being overtight, he will complain that his shoe fakes his foot sadly. It also describes the doing of any act, or the fabricating any thing, as in to fake your slangs, meaning to cut your irons in order to escape from custody. Is to create a sore leg or to cut it as if accidentally with an axe, etc, in hopes of obtaining a discharge from the army or navy, or to get into the doctor's list, etc. Is to write a letter, or other paper. Is to shape out a skeleton or false key, for the purpose of screwing a particular place. Is to pick a pocket, etc, etc, etc. Meaning: Go on with your operations. An intimation from a thief to his pall during the commission of a robbery or other act. The ‘fakement’ or ‘fakeman‑charley’ means the act or thing alluded to in a ‘fake’ and on which your discourse turns. Consequently any stranger unacquainted with your subject will not comprehend what is meant by the ‘fakement’. For instance, having recently been concerned with another in some robbery and immediately separated, the latter taking the booty with him, on your next meeting you will inquire: What he has done with the fakement? meaning the article stolen, whether it was a pocket‐book, piece or linen, or what not. Speaking of any stolen property which has a private mark, one will say, there is a fakeman‐charley on it. A forgery which is well executed is said to be a prime fakement. In a word, anything is liable to be termed a fakement or a fakeman‑charley provided the person you address knows to what you allude. Are comprehended under the title of the family. All such are termed family people. Or which the owner sets particular store by, is termed a fancy article. As in a fancy clout, a favourite handkerchief, etc. So a woman who is the particular favourite of any man is termed his fancy woman, and vice versâ. To fence any property is to sell it to a receiver or other person. To fib is to beat with a stick, also to box. A person who has had a long course of experience in the arts of fraud, so as to have become an adept, is termed an old file upon the town. So it is usual to say of a man who is extremely cunning, and not to be over‑reached, that he is a deep file. in the old version of cant it signified a pickpocket but the term is now obsolete. 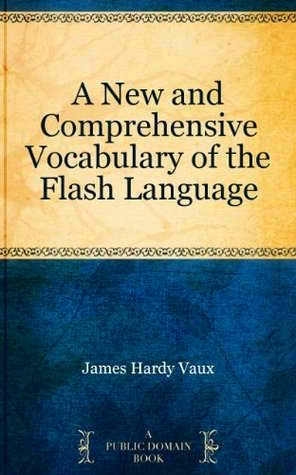 To speak good flash is to be well versed in cant terms. Such as swearing, dressing in a particular manner, taking snuff, etc, merely to be taken notice of, is said to do it out of flash. Synonymous with being fly, down, or awake. To put a person flash to any thing, is to explain or inform him of what he was before unacquainted with. As in I flash'd him a bean, meaning ‘I shewed him a guinea’. Don't flash your sticks, meaning ‘Don't expose your pistols’, etc. The master of which is commonly an old prig, and not unfrequently an old‑lag. Generally applied to those dissolute characters upon the town, who subsist upon the liberality of unfortunate women, who in return are generally at hand during their nocturnal perambulations to protect them should any brawl occur, or should they be detected in robbing those whom they have picked up. Generally relating to the exploits of the prigging fraternity in their various branches of depredation. In a general sense, any honest man or square cove, in opposition to a sharp or cross‐cove. When used particularly it means the person whom you have a design to rob or defraud, who is termed the flat or the flatty‐gory. Any person who is found an easy dupe to the designs of the family is said to be a prime flat. Meaning that though a man may be repeatedly duped or taken in, he must in the end have his eyes opened to his folly. Or any act of folly or mismanagement in human affairs. Either for the purpose of robbery, or to effect your escape, is termed flooring him. Not easily robbed or duped. A shopkeeper or person of this description is called a fly cove or a leary cove. On other occasions the word is synonymous with flash or leary as in: I'm fly to you or I was put flash to him, etc. To put your forks down is to pick a pocket. Used by cracksmen to obtain a light. To frisk a cly is to empty a pocket of its contents. To stand frisk is to stand search.